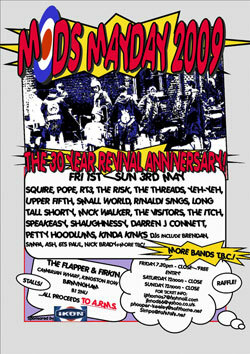 It’s a good six months off as yet, but if you’re a fan of the revival sound, you might want to stick a date in your diary for the 30th anniversary Mods Mayday 2009. That date is the May Day bank holiday weekend, with the three-day event featuring a number of bands from the late 70s and 80s, along with a few ‘mod-friendly’ bands from the modern era. It takes place in Birmingham and full details (as far as they are currently known) are listed in the Modculture events section. Tickets for an as-yet unconfirmed price will be on sale early in the new year.